Fremont, CA, July 6th, 2016 — ZPE Systems unveiled (IP patented) NodeGrid USBTM – A truly unified solution designed for mobility development and testing environments. NodeGrid USB improves productivity in the mobility development cycle by replacing the inefficient and expensive mishmash of different USB hubs, power bricks, storage, servers and cables. NodeGrid USB simplifies mobility lab deployments, saving rack space, power, configuration and management time with an all-in-one, high-density 96 USB type C port 2U storage and server appliance. Designed by industry veterans, ZPE Systems brings forth a fully enclosed, high-density, space saving Unified Mobility Infrastructure TM solution that addresses the needs of mobility labs, data centers and engineering test labs. NodeGrid USB integrates with mobility development tools, USB device reservation tools and orchestration tools for dynamic environments and team collaboration. NodeGrid USB cuts device overhead costs, providing the ability to share and remotely access USB devices. NodeGrid USB has 96 USB Type C ports integrated with a fast quad-core Intel CPU, built-in large storage, dual 10GbE SFP+ network and latest 64-bit Linux OS. NodeGrid USB is equipped with lightning-fast USB data transfer, management and control, and provides continuous quick charge power output to USB devices, all within an ingenious 2U box. Power all 96 USB devices while running tests. ZPE Systems is the data center industry’s first provider of Software Defined Infrastructure to manage physical and virtual IT devices. The company’s NodeGrid platform simplifies access and control of compute, network, storage and power infrastructures. NodeGrid Manager provides OOB management of IT devices. NodeGrid Serial Console enables OOB control of serial devices. NodeGrid [CI] protects converged infrastructure. NodeGrid Flex and NodeGrid Bold control devices at the edge of the network. NodeGrid USB provides a high-density USB type C mobility development cycle environment. ZPE provides smart, consolidated IT management solutions that reduce downtime and CAPEX/OPEX. The company is headquartered in Fremont, California with resellers in Japan, UK, Netherlands, Brazil and India. ZPE Systems, the ZPE logo and NodeGrid are registered trademarks or trademarks of ZPE Systems. Other company and product names may be trademarks of their respective owners. 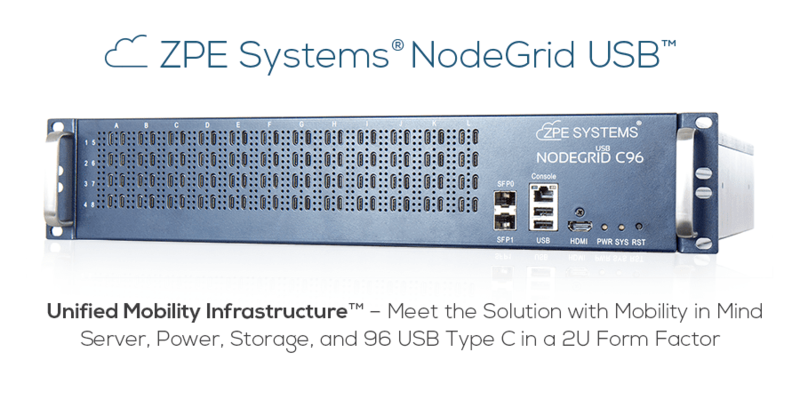 Share the post "ZPE Systems Announces NodeGrid USB™"